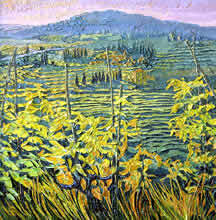 "In Tuscany I had a studio at Strove, near Casole d' Elsa and many of the paintings were done in the orchards and vineyards there. The patterns of rich dark green foliage, set against the pale Indian red soil was a great turn on. " 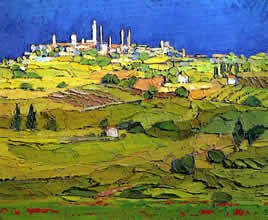 "I also did a series of paintings around San Gimignano, that most imposing of Tuscan towns. I painted it using the skyline as a back drop and set these extraordinary towers, at a distance, amongst the intricate and ordered patterns of the landscape." 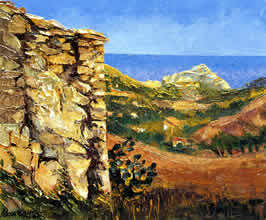 "I Painted in Sicily in the spring of 2004. 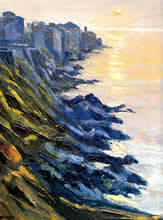 I discovered an island of contrasts of irregular, varied coastline and sun baked hills. Most of my paintings were done in these hills, where the sensual rolling shapes, draped in ever-moving light and shadow were a visual feast." 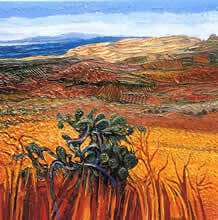 "When I was in Morocco, my dealer David Messum, who travelled with us, urged me many times to draw and paint the cacti, but in an arid desert they did not appeal. 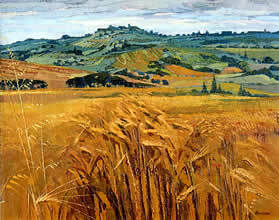 Amongst the fields of golden crops, however, these extraordinary, green sculptured shapes seemed to naturally relate to the landscape and these formed the basis of a series of large paintings."